A community-wide effort to quantify tropospheric ozone in a rapidly changing world. Tropospheric ozone is a greenhouse gas and pollutant detrimental to human health and crop and ecosystem productivity. Since 1990 a large portion of the anthropogenic emissions that react in the atmosphere to produce ozone have shifted from North America and Europe to Asia. This rapid shift, coupled with limited ozone monitoring in developing nations and remote regions of the world, left the research community struggling to maintain an up-to-date assessment ofozone in the troposphere. In response, the International Global Atmospheric Chemistry Project (IGAC) initiated TOAR in 2014 with a mission to provide the research community with an up-to-date scientific assessment of tropospheric ozone’s global distribution and trends from the surface to the tropopause. The assessment report is published here as a series of research papers. The findings are based on the most comprehensive collection of surface and free tropospheric ozone observations ever assembled. In a major advancement, TOAR has created a database containing a wide range of ozone exposure and dose metrics, calculated consistently for all available surface ozone monitoring sites around the world, and freely accessible for research on the global-scale impact of ozone on climate, human health and crop/ecosystem productivity. 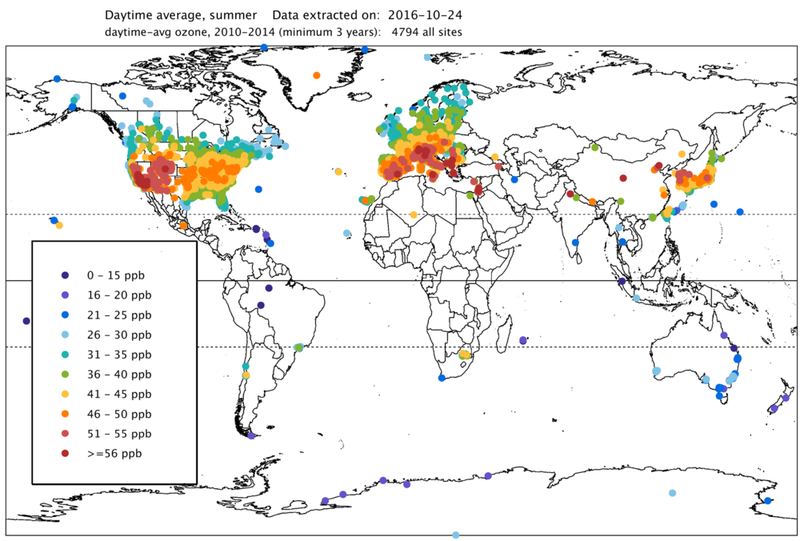 Daytime (8:00 – 20:00 local time) average ozone at 4794 global surface sites (all available) during summertime conditions (April-September in the Northern Hemisphere, and October-March in the Southern Hemisphere) for the present-day period, 2010-2014. 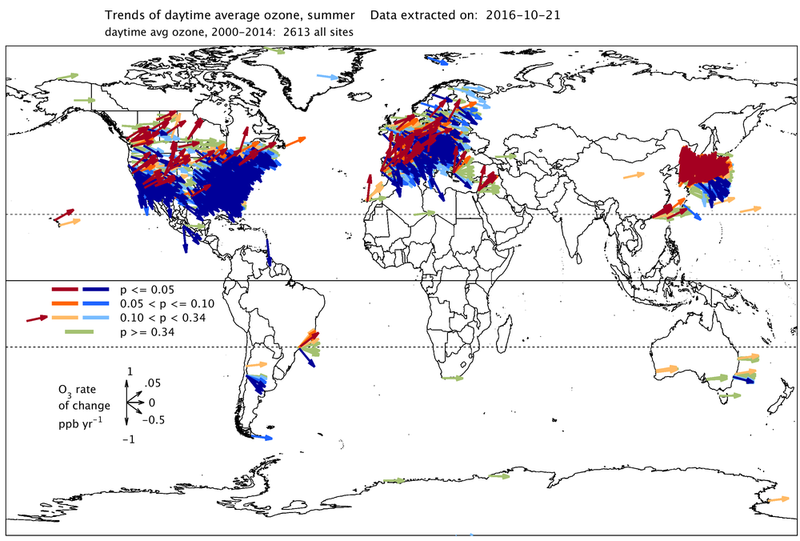 Trends of daytime (8:00 – 20:00 local time) average ozone at 2613 global surface sites (all available) during summertime conditions (April-September in the Northern Hemisphere, and October-March in the Southern Hemisphere) for the period, 2000-2014. Vector angle indicates the ozone rate of change, while vector colors indicate the p-value associated with each trend vector. Daytime (8:00 – 20:00 local time) average ozone at all available surface sites in three regions during summertime conditions (April-September in the Northern Hemisphere, and October-March in the Southern Hemisphere) for the present-day period, 2010-2014. Trends of daytime (8:00 – 20:00 local time) average ozone at all available surface sites in three regions during summertime conditions (April-September in the Northern Hemisphere, and October-March in the Southern Hemisphere) for the period, 2000-2014. Vector angle indicates the ozone rate of change, while vector colors indicate the p-value associated with each trend vector.